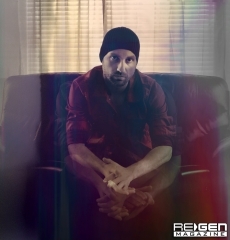 Derek Walborn speaks with ReGen on the development of Ghostfeeder’s audio and visual aesthetic over the years, culminating in the band’s latest album on Distortion Productions, World Fameless. Since 2010, Derek Walborn has been honing his craft and his songwriting chops to make Ghostfeeder a small but exciting new name in underground electro/industrial music. 2014’s The Messenger brought the band a new level of recognition with an edgy production savvy on par with the more dynamic works of Nine Inch Nails, filled to the brim with melodic passages that made for a highly enjoyable listen. 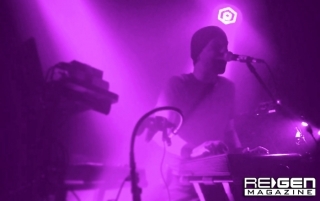 Taken to the live environment, Ghostfeeder toured with En Esch the following year, opening the band’s music up to a wider audience. Signing to Jim Semonik’s Distortion Productions for the next album, 2016’s World Fameless shows Walborn approaching a more streamlined and straightforward aspect to his songwriting, adding an almost pop sensibility without losing any of the energy that the band has demonstrated thus far. 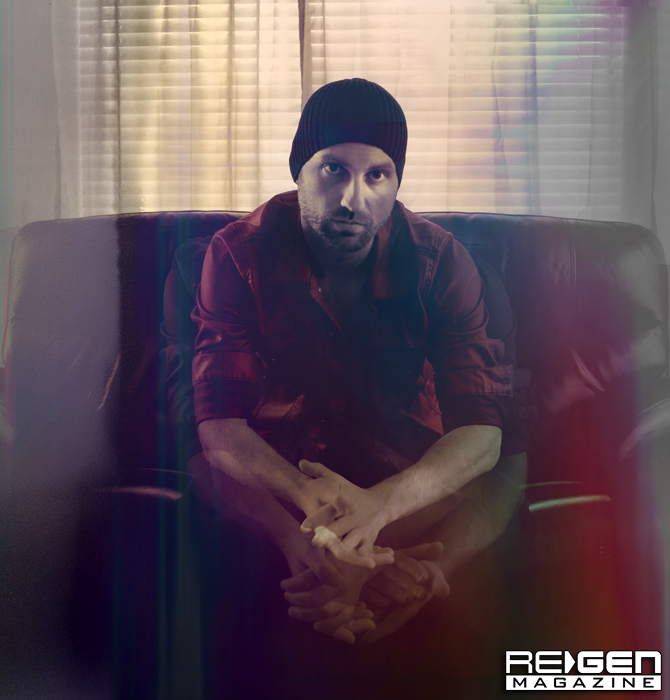 Walborn was kind enough to speak with ReGen on the development of Ghostfeeder’s audio and visual aesthetic over the years, touching on his partnerships with artist-run labels, touring, and all points in between. You’ve signed with Distortion Productions for World Fameless, while your last album, The Messenger was with Beyond Therapy Records. Having worked with two prominent artist-run independent labels, what are your thoughts on how they and others like them represent a new and working business model for the music industry? What sorts of changes do you foresee happening – or would like to see happen – in the way music will find new ways for distribution/marketing in the future? Walborn: I am speaking from very limited experience, but I do like the idea of label management kind of being ‘in the thick’ of being an artist with me. There isn’t really any big danger of something coming from a weird, detached entity, and everyone knows what it’s like to be an artist – hard work and dedication is noticed and appreciated. It kind of feels like the artists and the labels have the potential to grow together if everyone puts in the effort. A nice, mutually beneficial relationship can definitely be garnered when efforts are in sync. A label that wants to see its artists grow will plug them as often as possible, and the therefore an appreciative artist plugs the label in turn. In the end, it looks like everyone knows what they are doing, and that’s good for business! 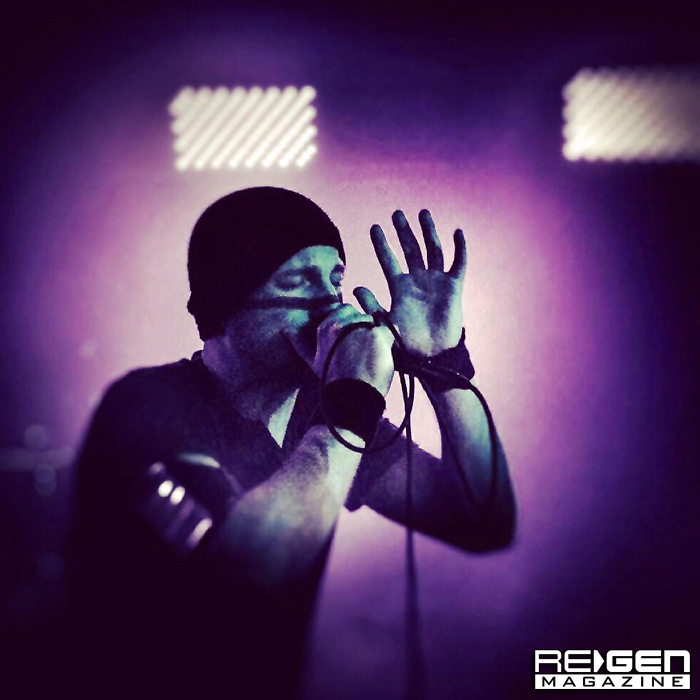 You’ve stated that World Fameless was ‘constructed with the intention of making an immediately accessible, in-your-face collection of punchy, powerful songs,’ as a result of your experiences on tour with En Esch. Can you elaborate on those experiences and how they shaped your outlook on writing the new material? I have a handful of songs that I am very happy with, but that just don’t translate well to live performances. I think every artist has that issue. With World Fameless, I just wanted to try my best to minimize the struggle of taking a song with 40 or more tracks off an album and turning it into something that one or two people could perform and perform well. I wanted to make songs that could jump off of the album and onto the stage. There is a notion that since sales of music are lower than they once were, a band truly survives only by playing live. What are your thoughts on this based on your recent tour? Walborn: I think that the ‘band touring the country in a van and selling shirts and CDs’ is a really old fashioned model, and for many, many artists, it simply is not a sustainable business method. Having said that, it’s been around for so long because at the end of the day, it still can work. It works to get your name out there and it works to make fans. Does it work to make money? It depends on your level of notoriety and the kinds of crowds you either pull in our get to play in front of thanks to a more well known headliner. In my experience, I have played shows in front of 15 people and sold multiple CDs and shirts to every person in attendance. I have also played in front of hundreds of people and sold three stickers. There is definitely a degree of roulette you are playing when you take yourself on the road, but unless you are a social media wizard and can market yourself to the point where you don’t even need to play to sell music, it’s still the most effective way to make sure there are a few people in every state wearing your band’s shirt. All of your releases up to now have been shorter EP releases – what are your thoughts on the album format as it relates to Ghostfeeder? Walborn: Ghostfeeder’s past releases were all EPs, because A: I don’t want to sit on songs for too long before I put them out there, and B: people are more interested in singles and quick fixes in their music these days as opposed to sitting down with a pair of headphones and allowing an artist to have their undivided attention for 45 minutes. I think it’s a bummer as I love getting lost in a well crafted collection of songs, but I’m not going to try to bend reality to my whims. World Fameless was a longer release mostly because I simply had the material to fill it, but I also wanted to make something a little more substantial for a release on Distortion, as the profile would be a little higher this time around. It all worked out for the best in the end. Electronic influences seem to be more prevalent than ever in music – what are your thoughts on the way audiences have come to accept or appreciate the role that technology plays in helping artists to bring their music, no matter what the genre, to them? Walborn: I enjoy that technology has really brought a lot of the impenetrable stuff from the professional recording studio right to your laptop. I don’t think it’s ever been important to audiences if you paid $1,000 an hour to record and produce your song in your city’s most well equipped studio, or did it in your bathroom that you converted to a vocal booth for the weekend. All people want is a good song. The path you take to get to your final product is irrelevant to everyone except fellow musicians who like to compare gear and see who has the most vintage microphone preamps or whatever it is that musicians geek out about. I wouldn’t know. I think that younger people in general are more open to technology being an integral part of what makes modern music tick. There will always be a time for the sincerity of a person who can walk on stage with only a mandolin and absolutely blow the audience away, but I think we have a few generations now who can equally appreciate an EDM artist turning some knobs in front of a few thousand people and blowing them away in a different sense. I don’t think younger people care about the technology or ‘electronic influences.’ Electronic music has become so ubiquitous that there is almost becoming no reason to define it. It’s all just ‘music’ now. What do you see or would like to see as the next step in the evolution of technology – not just in music, but overall – and why? Walborn: Virtual reality is only going to get more and more advanced, and I think that’s really interesting. People have been saying this for decades, but I feel as though we have finally reached a point where we can really see where the future of entertainment is headed. I feel like we are setting ourselves up for a future where people can just get lost in a virtual life of their choosing, which is a little frightening when you consider whether or not reality actually exists or is just the sum of our sensory perceptions. With that, I will move on to the next question before I start sounding like Morpheus. As a musician, what do you find to be the major challenge in keeping up with new developments in music, technology, etc.? Walborn: From a purely logistical standpoint, updating your technology every time there is an OS change can be really frustrating. A guitar always stays a guitar, but when you make music with software that has to talk to hardware, a real Pandora’s box is opened up and it leads directly to your wallet. Software gets updated, then your plug-ins need to be updated, then your hardware needs to be upgraded – it’s an endless cycle. It’s especially bad when a company decides to stop supporting your favorite plug-in or effect and it’s no longer compatible with your current configuration. The same thing happens with audio interfaces and all kinds of stuff; you end up loving a piece of gear because it lasts forever and is built like a rock, but all it takes is a little software update to make it immediately obsolete. You’re at the mercy of the companies who want to make money off of you. Sometimes I think I should have been a folk singer and just travel the world with my acoustic guitar. 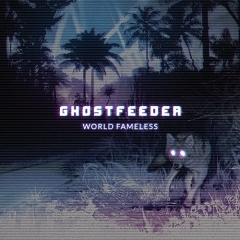 Regarding Ghostfeeder’s visuals, I’ve noticed that the band seems to stick with a particular color scheme, both in the album artwork and the videos you’ve done. 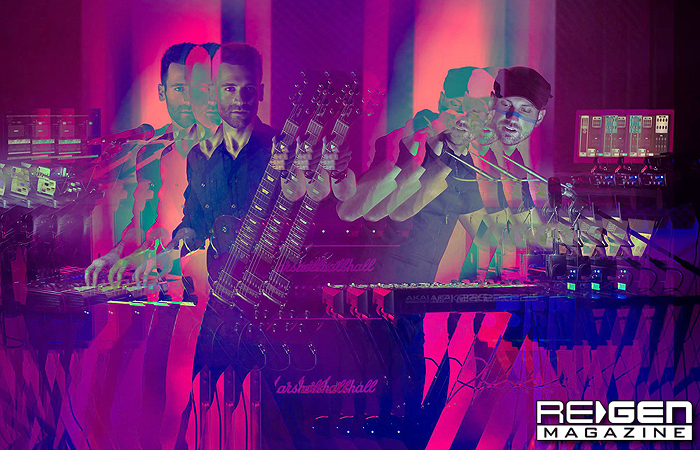 What can you tell us about the imagery and how it translates to the music? Walborn: I think that establishing a brand is really important. A lot of people tend to lose focus on this aspect of being a musician because, to them, it feels like some sort of corporate, capitalist notion handed down from ‘the man.’ The reality is you need to focus your creative energy on what you are just as much as what you sound like. All of your favorite bands have done this, and that’s probably why you enjoy them so much. 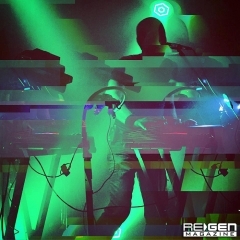 As far as how the imagery ties into the music, I have always enjoyed the harshness that can sizzle out of a lot of electronic sounds; all the weird little glitches and buzzes that come with technology being pushed to its limit, or going off the rails in some way. A lot of that ends up in my music. I think that the visual aspects of Ghostfeeder are really just me approaching the artwork in the same way. I try to make what you see complement the audio to provide as seamless an experience as I can. Luke Dangler did the artwork for World Fameless, and I think he did a great job. We did a lot of idea hashing ideas back and forth and I think he really nailed the kind of feeling I was going for, visually. What can you tell us about how you’d like to develop this side of Ghostfeeder? Walborn: I can really just apply the same two words that I have applied to this project since its inception: ‘More’ and ‘Better.’ I am never content to sit back and watch things just happen. I am constantly tinkering with everything. How can I make this song better live? How can I build a more efficient computer stand that is easier to get on and off the stage? How can I enhance this light show? How can this artwork be better? It’s maddening, but it’s definitely satisfying to feel yourself grow. As a perfectionist, the satisfaction doesn’t last long, however. I think I will live my entire life constantly chasing it.